Tread Plate is also known as Diamond Plate and comes in different thicknesses. Because the tread plate has no even surface, it is often used in areas to prevent slipping and get injured. But tread plates / diamond plates are also often used to protect a floor or to bridge a gap. Due to its structure it is very strong and can be used in many different ways. Many customers use the tread plate as a good looking floor protection to but beneath a grill protecting the front or back porch wooden of tiled floor from crease and sparks, But tread plate can be used in many different ways, as this project from one of our customers shows. 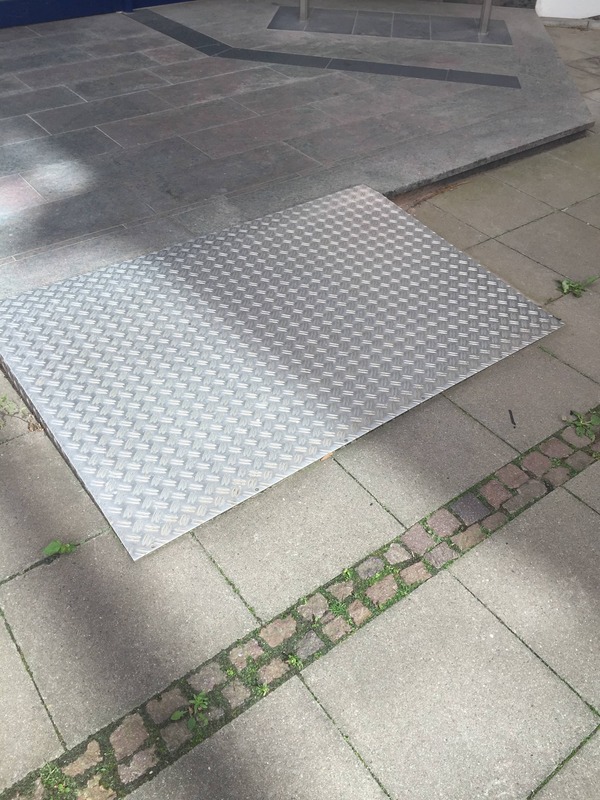 This customer wanted to have a small ramp, to allow handicapped people and wheel chairs to easily overcome the small stair which is in front of a building. Supported by bend down sides to strengthen the stability, even a wheel chair can go up the metal ramp and overcome the little stair. The customer send us a detailed drawing of what he wanted, and we where able to cut and bend the tread plate just the way the customer needed it. We offer tread plate in two kinds of metal, aluminum and steel, offered in different thicknesses,depending on the purpose of use. Have a look and build your own tread plate just the way you want it. If the 14 different forms and shapes are not what you are looking for, send us an electronic file showing your project in detail.